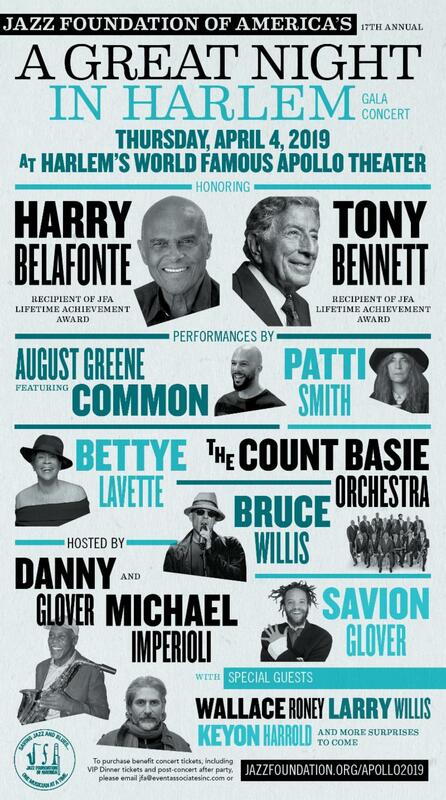 "A Great Night in Harlem"
Now celebrating 30 years, the Jazz Foundation has been keeping jazz, blues, roots, R&B, and soul alive by helping the musicians who have played with everyone from Duke Ellington and Billie Holiday to Jimi Hendrix and The Rolling Stones. Our social work services provide housing assistance, pro bono medical care, disaster relief, and emergency financial support to musicians and their families in times of crisis. Through our Jazz and Blues in the Schools and other performance programs, we create dignified employment for musicians who are too old or too ill to tour, and reach thousands of public school children every year. Whatever the need is, we don’t just fix the problem, we heal it with creative solutions and love. Your support to the Jazz Foundation helped provide assistance in over 9,000 cases last year alone, throughout the United States, including our ongoing efforts in Puerto Rico. Next Catch Acclaimed Percussion Master Ralph Peterson Jr. at Zinc this Saturday, March 30. Book your tickets now! Previous Catch Acclaimed Percussion Master Ralph Peterson Jr. at Zinc this Saturday, March 30. Book your tickets now!